I attended an informative presentation in early November. It was conducted by the Canadian Mortgage and Housing Corporation. As a Real Estate Broker and a Real Estate Investor, I am especially interested in the outlook for the next 12 to 18 months. The CMHC presenter laid out the known statistics for the first nine months of 2017 and a projection of the last quarter of the year and the expectations for next year. Now that we are at the end of the last quarter of 2017, entering into the new year hoping to maintain a good level of market activity, I am also comparing the statistics provided by Teranet/The National Bank of Canada. It must be noted that these projections are not fact, but speculation based on historical information and the economics surrounding all the many aspects which drive markets. It should also be noted that the sales DO NOT include newly constructed homes. While I often recommend new construction to some types of Buyers, it is not an option for all home Buyers. In the case of Real Estate, specifically in my practice area (Hamilton-Burlington), we consider the supply and demand of popular forms of Residential Real Estate. We must also observe the factors of population change, employment change, expected new home construction, average prices, the total number of home sales and the average time it takes to sell a home. This report is my take on the statistics and projections. It is my opinion and not intended to act as a predictive recommendation. Nobody really knows what will happen in the future. We can only take the information given and compare it to other times when similar forces were at work. First, let me say that every market situation has benefits for both buyers and sellers but sometimes these advantages can be out of balance and cause one group or the other to feel at a disadvantage. While there is no real doom and gloom foretold by these new statistics and predictions, both buyers and sellers need to be aware of the possible aspects that may affect their home ownership plans over the next several months. As most people will be aware, the past several years have given us incredible growth in real estate values and this has resulted in a massive amount of activity. There were lots of people selling their homes and using the equity to ‘buy up’. Buyers sometimes found it difficult to find homes or they would be forced to compete with many other buyers in a bidding war for the property. Bidding wars pose other problems for buyers in that they will often be forced to make offers that are well over asking price and may even be forced to exclude reasonable and important conditions such as home inspections and financing approval and other conditions important to be a well-informed buyer. This recent expanding market was great for sellers because it brought in huge offers, well above asking. Realtors benefitted from this market because higher sale prices make higher commissions. The problem was that the actual number of houses available to purchase was low compared to the number of Buyers. This created aggressive competition between realtors and brokerages. With fewer listings, fewer realtors were able to make commissions. This did not stop new realtors from joining the hot market despite the tightening of educational requirements. More realtors, fewer properties to sell, so fewer realtors were able to be professionally successful in a boom market. Those realtors who were lucky enough to land selling clients would spend little time marketing a property, enter the property in the MLS system, put up a sign, wait for offers and take the highest. The dreaded market correction or bubble burst was looming over our heads for the past eighteen months. When I saw 100 percent increases in value over just a few years, I could feel the correction coming. Well, it looks like 2018 has brought the correction. The government has introduced a few measures to slow the growth that was making prices soar. First, and perhaps most important is the change to the CMHC lending rules. The changes can best be described as an increase in qualification requirements and thus a resulting decrease in buying power for those buyers obtaining uninsured mortgages. These changes were to come into effect on January 1, 2018. Those buyers who signed offers to purchase and received mortgage commitments from their lenders before the end of 2017 were qualified at the current market interest rates. Once January 1st rolled around, those buyers who did not ink a deal before the end of the year are subject to more stringent qualifications. Namely, buyers applying for a high ratio mortgage will be required to qualify for at least a 2% higher interest rate. Mathematically, this could mean a drop in buying power of as much as $200,000 for a household making $100,000 yearly income. It is important to note that not all buyers will be adversely affected. If you are considering buying a home, you should meet with your mortgage provider to look at your numbers and start the qualification process. That is the worst of the bad news for buyers and by extension for sellers as the market will feel far less buying pressure. However, this is by no means the death knell for our robust market. Ontario’s population is one-third of the population of Canada as a whole and The Golden Horseshoe (the communities on the shore of Lake Ontario from Oshawa to Niagara) comprises a full two-thirds of the population of Ontario. Only Chicago, Los Angeles and New York City metropolitan areas are larger. The simple fact of the size of our market is HUGE should being comfort to homeowners and investors. There will always be a robust need for homes and hence a robust market. The market pressures will influence the state of our recent SELLERS’ market by leaning toward a more balanced market. There is plenty of frenzied decision making in a Sellers’ Market when we simply do not have enough properties to meet the demands of Buyers. The properties receive multiple offers, over-price offers, and offers without conditions all in the first days of their listings. Still, other situations arise in which Realtors do not necessarily want to place their clients. As Realtors, we want you to be happy and secure in your purchase, not cursing us when, eighteen months down the road, you feel that you overpaid for a home that is highly flawed or structurally unsound. That said, the balance between buyers and sellers is correcting itself. We were strongly in a Sellers’ market for so long, both Sellers and Buyers EXPECTED to have competition for purchases. There was also a practice of under-pricing new listings to invite massive interest. This practice is deemed as non-compliant to our ethical standards in Ontario. Our code of conduct states that we shall not list any property at a price which the Seller is unwilling to accept. Realtors using this technique are taking queues from the less regulated, highly competitive and frequently unstable and unethical US market. Never forget the sub-prime mortgage fiasco that leaked into our lovely stable market around 2008. As the balance shifts, we will find Buyers regaining some advantages. Buyers can be more discriminating in their property shopping. There will be less competition for many properties except perhaps for the most popular family homes in the best condition or at the most affordable prices. Buyers will also have more negotiating power as competition subsides, allowing the inclusion of home inspection clauses and other conditions which protect Buyers. On the Sellers’ side, we can relax about perfecting the property. If prices and competition soften, we can hold back on the home improvements. Buyers would be happy to save on cosmetic improvements which they can complete on their own. Major structural repairs and changes may still have excellent value to Buyers but, as with cosmetics, sometimes the money is better spent by the Buyer instead of the Seller. So, now the best of the bad news, prices are softening, or at least stabilizing. With double-digit growth year over year for nearly a decade, we feared the bursting of this so-called bubble. If we did experience a burst, we should have seen a huge drop in prices. In the past 12 months, we still have an overall increase in home prices over last years prices. This means that as of December 2017, an average property still commands a higher sale price than the same property a year earlier. The drop in price has occurred in the most recent months when compared to the PEAK, RECORD SETTING prices of spring 2017. GTA prices saw a drop immediately following the record-setting prices in Spring 2017. But remember, these year-over-year increases are still intact. Even with some prices falling as much as 5% over the summer months, the average prices were still higher in 2017 than they were at the same time in 2016. The peak of record-setting prices in the Hamilton Burlington region was in August 2017. Another interesting figure of note is the House Price Index calculated from actual sales. For Toronto and Hamilton, the Index is around 225. This means that since 2005, prices in these areas have increased by 125% despite the huge losses in 2008. 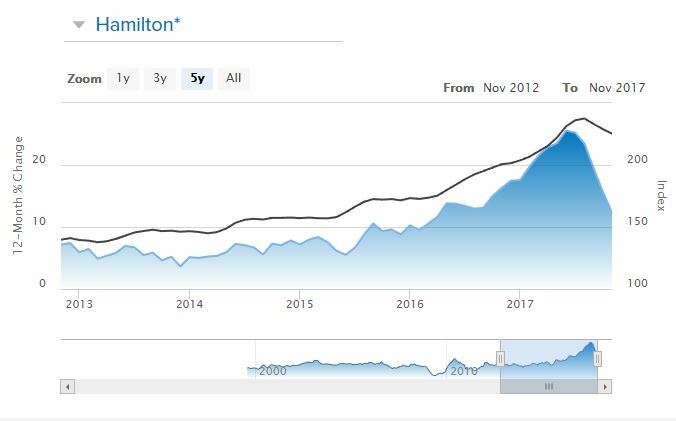 The figures over the past quarter or so have indicated definite declines and as of November’s report, three straight months of price declines were reported for the Hamilton Region totaling about -4.3% and for the Toronto Region, price declines totaled -7.1%. These declines take away a very small part of the overall gains since this same time last year. Finally, the numbers of home sales have also declined over the second half of 2017. We saw investors leaving the market after the peak prices. In addition, the January 1, 2018 Mortgage Rule changes brought about a brief increase in sales as Buyers scrambled to sign offers and secure their lenders' mortgage commitments. All of these factors seem like a jumble of information. How can it be used to navigate through our new market? Sellers should expect that they will not have as much heated competition for their property. This is especially true for properties outside of the most desirable sizes, price ranges, and neighbourhoods. Sellers should expect to be on the market longer and accept offers which contain reasonable conditions. At this point, I would recommend that Sellers refrain from huge cosmetic expenditures and allow buyers to take on renovations in their own time. Buyers should find that they can relax a bit when shopping for a home. There should be less competition to buy and so less panic. Better decisions are made without panic. Bargains should still be found by looking for homes that need a bit of work. As of December 2017, I am still very optimistic about the upcoming Real Estate Market.